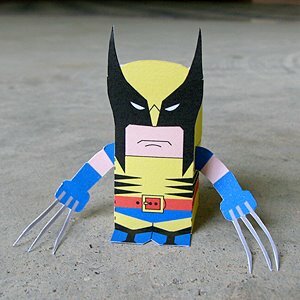 This paper toy is the Wolverine, based on the same named Marvel Comics, the papercraft is designed by Toy a Day. Wolverine is a fictional character, a superhero who appears in comic books published by Marvel Comics. Born James Howlett and commonly known as Logan, Wolverine is a mutant who possesses animal-keen senses, enhanced physical capabilities, three retracting bone claws on each hand and a healing factor that allows him to recover from virtually any wound, disease or toxin at an accelerated rate. The healing factor also slows down his aging process, enabling him to live beyond a normal human lifespan. His powerful healing factor enabled the supersoldier program Weapon X to bond the near-indestructible metal alloy adamantium to his skeleton and claws without killing him. He is most often depicted as a member of the X-Men, Alpha Flight, or later the Avengers.